May and June are great times to see ospreys (Pandion haliaetus), those wonderful seaside raptors that love to dive into water to catch fish and nest high in trees or on platforms. 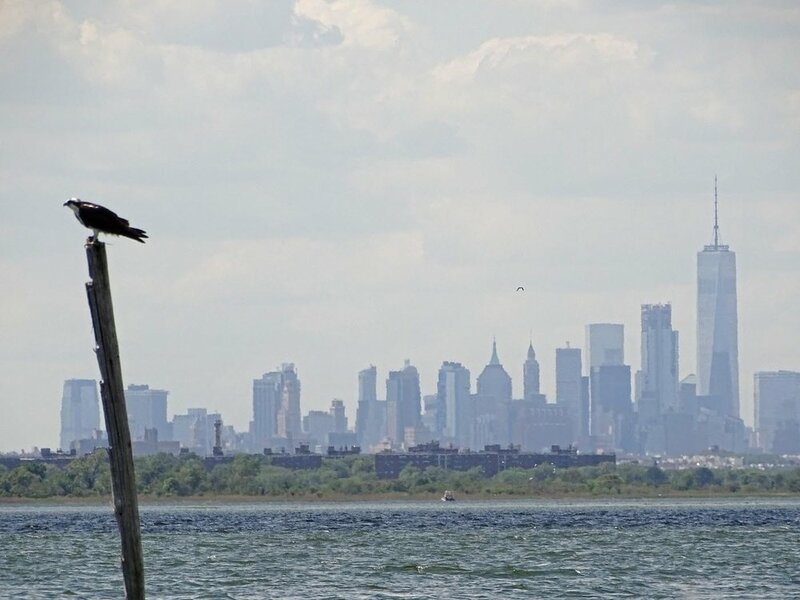 I have seen ospreys at Marine Park (Brooklyn), Jamaica Bay Wildlife Refuge and Broad Channel Park (Queens), and Mount Loretto and Great Kills (Staten Island). They nest in May, and by June have little ospreys sticking their heads out of the nest. In July and August, you can see the youngsters learning to fish, and see them keeping their eyes on their parents in case there is food to be had. There have been osprey flyovers at Central Park, but I've never seen one land there. They have a very distinctive flight, which you can see in the video below. They’re Back at Jamaica Bay Wildlife Refuge! 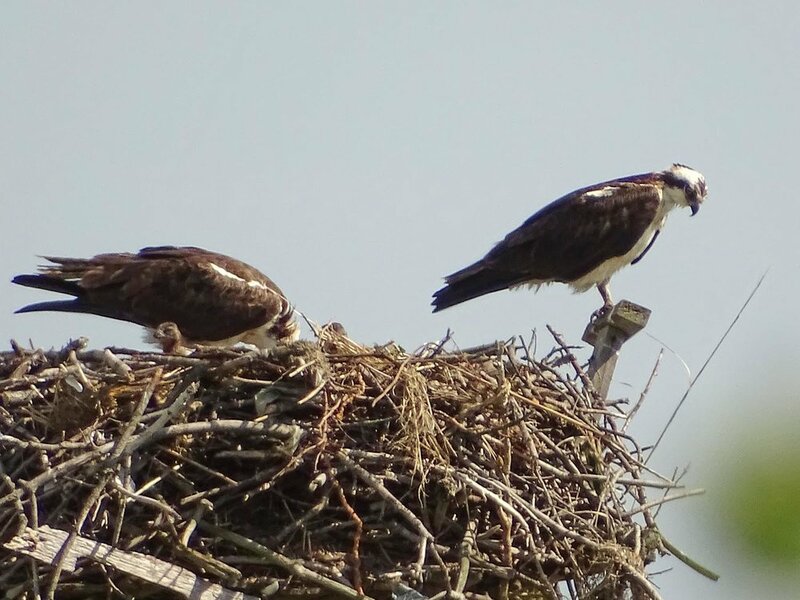 I was able to check the two nests at the Jamaica Bay Wildlife Refuge this spring (2019), and have seen ospreys at both nests, so we hope for little ospreys soon! Unfortunately, the New York City Parks Department has decided to “save” the wetlands at Sunset Cove Park down at Broad Channel American Park by bulldozing the trees that had been the perching place for the pair of ospreys that had nested there, so I suspect there won’t be a nest there this year. If there is, it will be hard to see, so I probably won’t visit it. However, I have seen one osprey at the nest I follow on Staten Island, so I hope for photos from there soon. 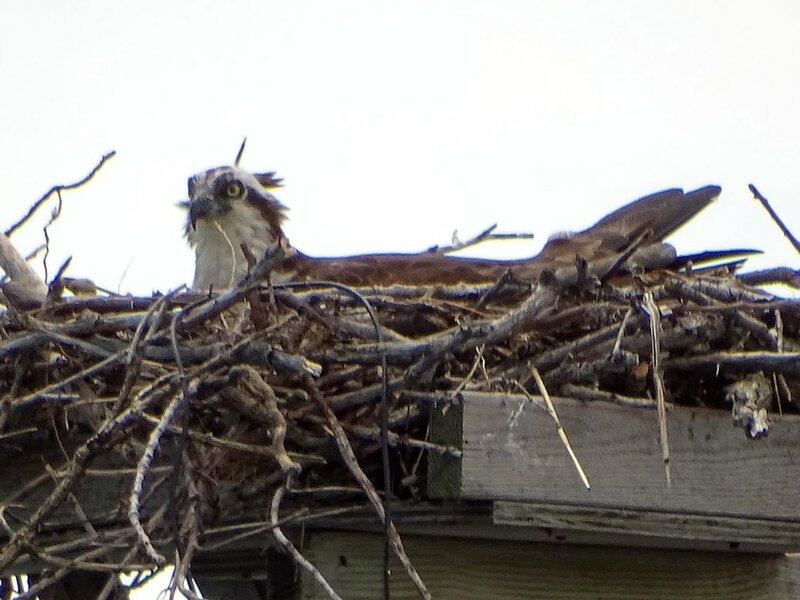 I saw both ospreys at the nest closest to the nature center at JBWR on April 6 (too far away for good shots), and I think both ospreys at the nest closest to Cross Bay north of the center. In the first two photos, the osprey was on a utility pole above the nest. The second two photos were taken from the sidewalk on the other side of the nest, and could be the same osprey or the mate. The nest has some trash in it that probably didn’t come from Ikea! An osprey from the Cross Bay pair watches over the nest at Jamaica Bay Wildlife Refuge, April 6, 2019. 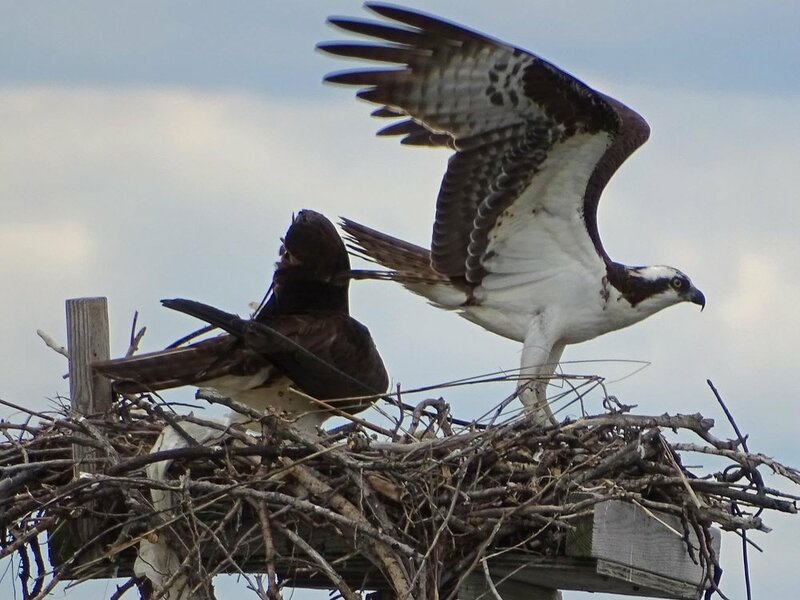 At Broad Channel Park, the osprey nest has a magnificent backdrop! This Filming the Feathers video was shot at a nest at Marine Park, two nests at Jamaica Bay and another nest at Broad Channel Park. Music is by Giuseppe Maria Cambini, Wind Quintets Nos. 1, 2 and 3, performed by Soni Ventorum Wind Quintet (obtained from MusOpen.org, a royalty-free music source). One of the nests at Jamaica Bay Wildlife Refuge has two babies, which you'll see sticking their heads up and flapping their little wings. The first osprey I saw was at Marine Park in July 2015. I didn't venture out to see others until May and June 2017.